For me to hear new stations nowadays requires extraordinary conditions. They don't come often, and sometimes the openings only last a few minutes. So, the name of the game is to be at the right spot at the right time. SDRs make this easier than it used to be. KKIN has apparently not been heard on this side of the Pole before. So imagine my surprise when I noted big band jazz music on 930 on Sept 18, followed by a strong and crystal clear KKIN identification! KKIN runs 2500 watts day, 360 watts night, in a non-directional pattern. Aitkin is a small town, less than 2,000 people mostly of German, Swedish and Norwegian heritage. A friendly response from KKIN's CE confirmed my reception. KTCT San Mateo CA 1050 was heard with good signal levels some days during KONG18. Their CE responded quickly after returning from his Pacific Ocean sailing trip. 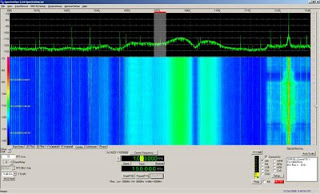 Islamic Voice, Melbourne VIC 1701 is a new station on the Australian x-band scene. Very good signal levels during KONG18. I suppose they would need no further presentation for the readers of this blog. Impeccable, both visually and performance-wise. Asking EUR 340 or USD 425. Preferably electronic bank transfer but Paypal accepted if 4% added. Shipping would be somewhere around EUR 30 or USD 35 (not insured). Email bm at kongsfjord dot no. Update November 10: Both have now found new homes in Norway and Canada. Sorry about not keeping you up to date on preps and events on the KONG18 DX-ped. OJ is maintaining this job excellently on this web update, so I'll rather post some specific comments instead. Loran C has, as most of my readers will know, been a major challenge for good readability. Through careful planning, good cables and 100 kHz notch filters for each beverage feedline I have managed to reduce the Loran C noise to an acceptable level. But this autumn, the noise level has inceased substantially. So much in fact, that on many frequencies low signal level DX has become impossible. The picture to the left says a bit about the problem here. 1070 to 1110 used to be frequencies with only very light interference; now the noise bleeds through even quite strong signals. Similar problems are seen from 660 to 700, 860 to 900, 950 to 1010, 1270 to 1300 and to a lesser extent 1460 to 1490 and on the x-band. The strong signal on 1134 is RSt. Mayak, Murmansk RUS. I don't know what has changed. I talked with the Loran C technician some days ago, he claimed there had been no changes done with the transmitter the last year. At any rate, surely locations without Loran C noise have a clear edge over Kongsfjord this year. I don't send many reports anymore, but a few still goes out. The past couple of weeks I had the pleasure of hearing two stations in the Fargo, ND area that I hadn't heard before, KFNW-1200 andWZFG-1100 (Dilworth MN), and I received very friendly responses from both. WZFG is currently covering Norsk Hostfest (which would translate to Norwegian Fall Festival) in Minot; North America's largest Scandinavian Festival. I have been invited to Fargo. We'll see how this evolves.